The trauma of July’s coup remains fresh in Turkish political life. Following the death of nearly 200 civilians and 160 coup plotters, indignation, fear and intense nationalism have driven Ankara towards a dangerously authoritarian crackdown on government opposition. The Turkish media, along with many government officials, have succeeded in stirring anti-American sentiment among the populace by suggesting that the United States government played some role in orchestrating the botched putsch. For many, the United States is currently “harbouring a terrorist”: a self-exiled cleric, Fethullah Gulen, who is currently residing in the remote Poconos Mountains of Pennsylvania. According to this line of reasoning, by “sheltering” Gulen, who is legally in the US on a green card, Washington is thereby complicit in his alleged attempt to oust the ruling party. Ankara has demanded his extradition. Western, especially American, audiences do not comprehend how one frail imam could be the source of discord between the US and a critical regional ally. Who is the supposed mastermind of the Turkish coup? Who is the man that—supposedly— wishes to orchestrate Erdogan’s demise, whether it be a fall from grace shrouded in corruption or a violent attempt on his life? Until July 15th, Gulen was virtually unknown in the West. However, in Turkey, Gulen is known as the spiritual leader of a secretive, transnational religious and social network under his name. A man of humble origins, Fethullah Gulen was born in eastern Anatolia in 1941. Raised under the influence of Sufi Islam, an order banned throughout the intense secularism of the early republican era, Gulen was deeply impacted by his conflicting duty to the state and the secretive nature of Sufi mysticism. As a preacher, Gulen expanded this repressed network from eastern to western Turkey, broadcasting a mission of “pious nationalist society.” Throughout the late twentieth century, Gulen’s movement inspire thousands of Anatolians to a life of service, prayer, and voluntarism. In addition to offering spiritual guidance, Gulen was a fierce Turkish nationalist who was devoted to grassroots schooling and mentoring the next generation of Turkish political leadership, his so-called “golden generation.” This mission extended to both the public and clandestine realms: organizations from schools, cultural organizations, publishing houses and business associations to the more secretive system of agabey mentoring services (“older brother” advice and guidance) and money laundering “foundations”. The international expansion of Gulen’s influence came with his move to the United States in 1998. Across the globe, many Turkish foreign service officers were encouraged to support and fund (himmet) Gulen schools in the countries in which they were stationed. In the US in particular, Gulenist Charter Schools cropped up across the mainland throughout the early 2000s. American Gulenist schools gained popularity as centres for excellence in the study of mathematics and science. US Charter schools and other Gulen-related entities do not support Islamic indoctrination: all are secular, with no direct linkages to Gulen himself. According to the Turkish government, there is a sinister element to the Gulenist network. Accordingly,the Turkish government considers Gulen as the head of a movement that has been labeled Fetullahçı Terör Örgütü (The Terror Organization of Fetullah’s Followers). The present nature of Gulen’s movement is difficult to describe: for years it was aligned with the ruling AK Parti in its efforts to purge state institutions and the military of devoted Kemalists and secularists who served in direct opposition to pro-Islamist forces. Both the Gulenists and the AKP perceived Kemalists as the “deep state” that conspired to starve Turkey of true democracy in order to maintain power. 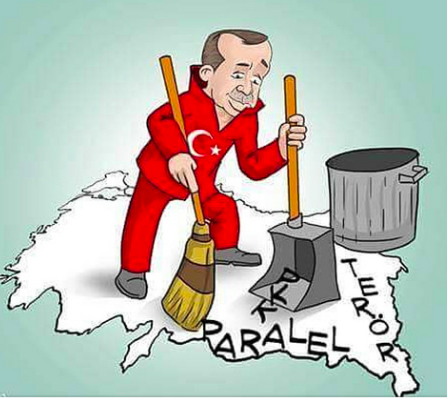 In time, however, the AKP also began to suspect Gulen and his followers of constructing a “parallel state” within the democracy. AKP leaders, such as Erdogan himself, began to grow paranoid by the concentration of devout Gulenist-educated civil servants, police, military and judiciary personnel within the government apparatus. Perhaps rightly so: the Gulenist tradition had placed many Turks from the upwardly mobile classes in high-ranking positions in the Turkish government. At the pinnacle of its influence, the Gulenist network was the “single most cohesive force” within the bureaucracy, judiciary and the foreign service. Appointments favored those with the Gulen connection. And, in turn, Gulen won their respect and devotion and amassed power and influence within state institutions. However, leaders such as Erdogan began to grow weary as to where Gulenists’ true allegiance lay. Gulen relocated to the US in 1998 to escape “investigation” by the government. It is difficult to pinpoint exactly when the rupture between the AK Parti and the Gulenist movement formed, but many trace their split to 2012 following a series of controversial trials and prosecutions of hardline secularists launched by the Gulen apparatus within the Turkish government. Following the imprisonment of hundreds of military officers, generals and academics, it was Gulenists who often filled their vacant stations. Gulenists within the state have also employed this tactic to drive AKP politicians from office. Most recently, in 2012-2013, Gulenists within the judiciary supposedly attempted to implicate Erdogan and his family in a corruption scandal. Since that witch hunt, Erdogan has sought retribution. The summer of 2016 presented the perfect opportunity. By “infiltrating” the police, the intelligence agencies, the military, and the judiciary in this progressive manner, the Gulenist network has been accused of slowly constructing a parallel state within Turkish democracy. These is some basis for Erdogan’s paranoia: Gulen’s cult-like cemaat (community) permeates many quarters of Turkish society, from religious organizations to independent and vocational schools. However, Erdogan’s militant distaste for the Gulenist tradition has made it increasingly more difficult to discern fact from fiction—truth from hyperbole. According to the Turkish government, the Gülenist movement is a ‘cancer’ that needs to be extirpated. Since July, over 2,745 judges have since been removed from office and/or jailed because of their ties to Gülen. An even greater number of civil servants, gendarmerie and police officers have been discharged from service with no recourse to appeal their dismissal or sentencing. Military officers implicated in the coup await trial, and possibly the death penalty. Erdogan’s assertion that followers of Gulen orchestrated the July 15th coup has some merit: evidence has shown that many Gulenist sympathizers were responsible for carrying-out the rushed plans of that fateful night. Nevertheless concerns of political, legal and humanitarian nature have been raised given the lack of due process shown those directly or indirectly implicated in the coup. Turkish officials have already dismissed Western criticisms, stating they do not need a “democracy lesson”. There is no doubt among the Turkish public that Gulenists played an integral role in orchestrating the July 15th coup. However, innocent sympathizers of the network have also faced significant oppression in its wake. The fact remains that the Turkish government lacks evidence demonstrating that Gulen directly sought to overthrow the Turkish constitutional order. According to Erdogan, sufficient prima facie evidence has been amassed and presented to US authorities to carry out swift judgement. Erdogan himself has personally asked Washington to to extradite Gulen to Turkey in both public and private declarations. Erdogan views Gulen’s extradition and prosecution as integral to Turkey’s “war on terror.” For the United States, Turkey’s extradition requests amount to a purely legal matter: this stance, compounded by delayed American support during the coup and condemnation of Erdogan’s purge of suspected Gulenist coup plotters, has challenged Turkish trust in Washington. In reality, however, the extradition process is lengthy: although the US has pledged legal assistance to Turkish officials, Secretary of State has firmly stated that Turkey must “present legitimate evidence in order to make judgments about [it] appropriately”. Should the Department of Justice feel uncompelled by Turkish evidence, US relations with Ankara are likely to plummet to new lows. Given the plethora of threats challenging the security of the Middle East and the stability of the international environment, Turkey is a critical American ally in the region. However, if the US fails to effectively navigate this political minefield, Ankara will realize it no longer gains from being anchored to Washington. Photos credits to Flickr Creative Commons.